With a population of over 2,100 Brickell Key is a man-made island that sits just offshore from the Brickell area of Miami. Brickell Key has a long and colorful history, dating back to 1896. Henry Flagler, known as the Father of Miami, used the soil from dredging a 9-foot deep channel in the Miami River to create two islands. Then, in 1943, Edward N. Claughton, Sr. purchased the islands and used additional bottom soil to combine the two into one island. Thus, Brickell Key was born. The island changed hands again in the 1970s. This time the developers, Swire Properties, created a master plan for Brickell Key that would take 38 years and over $800 million dollars to bring to fruition. 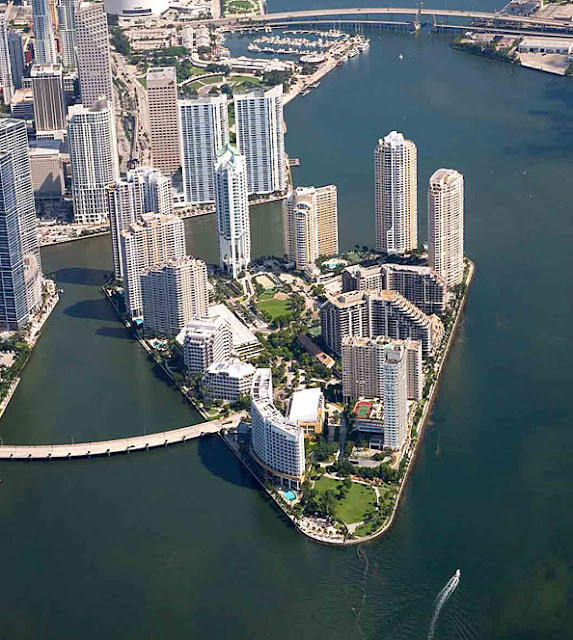 Today, Brickell Key is known the world over as a prime example of a mixed-use island community. 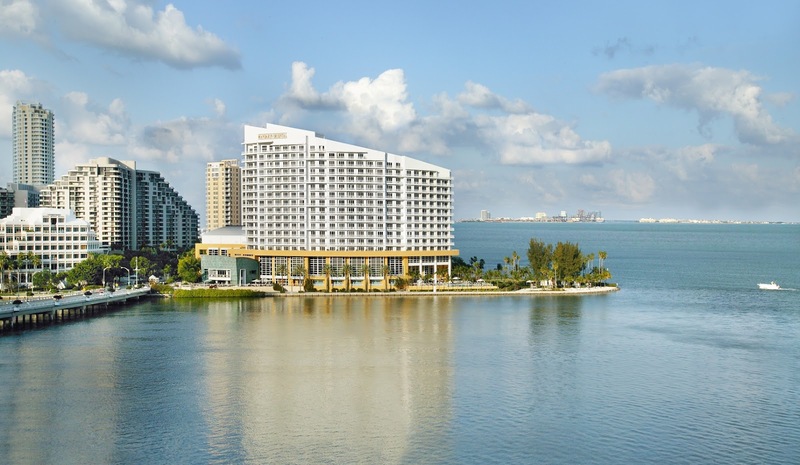 Ask any Brickell Key resident about life on the island and you’ll no doubt hear about Brickell Key Park. This island oasis is the ideal place to jog, walk, exercise and socialize the pooch or to just sit on one of the many benches and take in the amazing views. If you choose to walk the Promenade that runs around the island you’ll be treated to several sculptures from renowned Cuban artist, Manuel Carbonell. Be sure to see the 21-foot tall bronze sculpture of the Tequesta Indian blowing a conch shell, located at Tequesta Point. Another must-see sculpture is the "The Manatee Fountain,” located between Two and Three Tequesta Point. 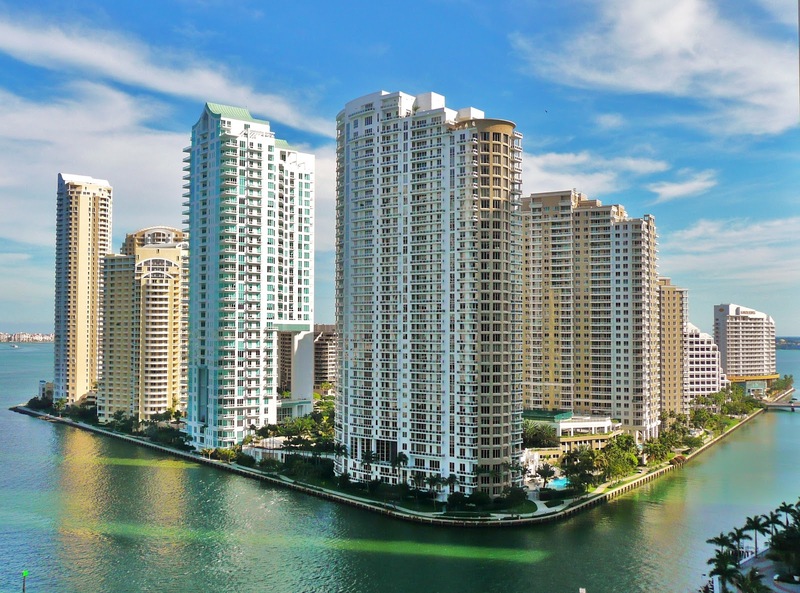 Living on Brickell Key puts you within steps of several amazing restaurants. 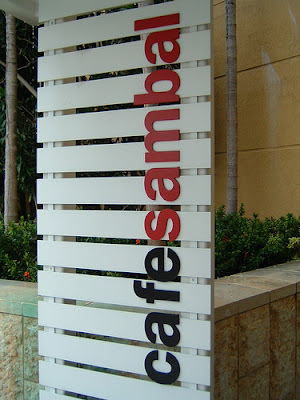 Here you will find both a dining and a shopping opportunity. Shop for gourmet food and wine from around the world, or dine at the Marketplace, indoors or outdoors. Offerings include hot gourmet food, deli sandwiches, sushi, pizza and salads. The Mandarin’s featured restaurant is Azul, offering European dishes with Asian and American influences. Azul’s extensive wine list features more than 700 labels from which to choose. Café Sambal, also at Mandarin Oriental Miami, offers Asian cuisine, a sushi and sake bar and views to die for. Located at 661 Brickell Key Avenue, at the Courvoisier Centre, NAOE is a very exclusive Japanese Restaurant known for its impeccable service. It opens from Tuesday through Sunday and reservations are strictly required. The menu starts at $85 per person. 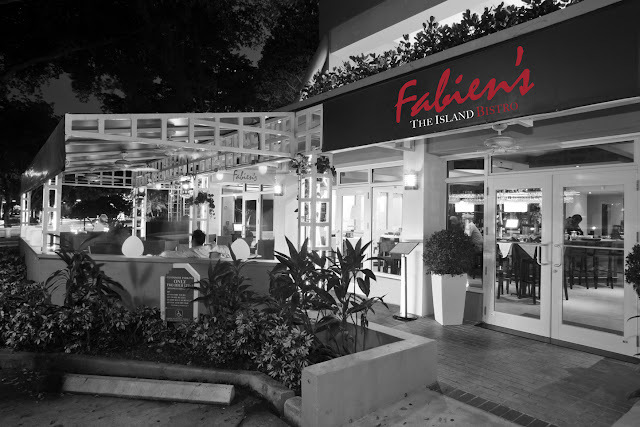 Fabien’s features classic French cuisine without the stuffy atmosphere found in so many French eateries. Fabien’s serves lunch and dinner and has a lovely cocktail area. 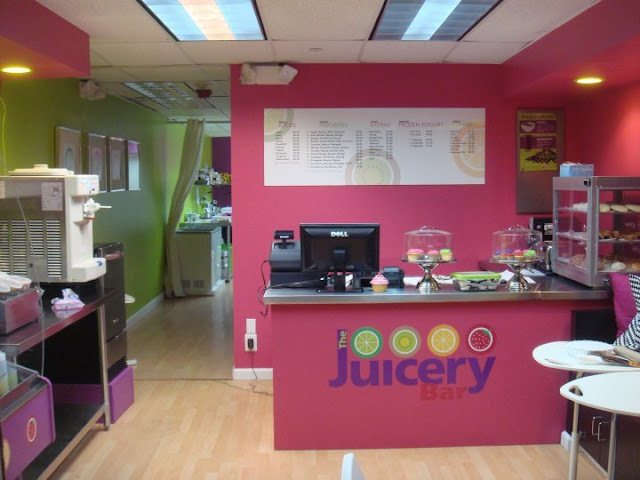 You’ll also find the Juicery Bar which just opened a couple of months ago right next to the Brickell Key dry cleaner. 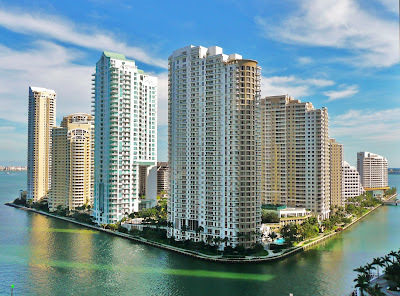 There are 11 condo communities on Brickell Key, each with its own unique offerings. 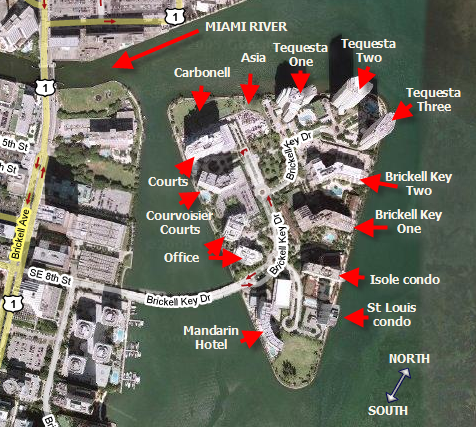 The buildings are: Saint Louis, Isola, Brickell Key I and II, Tequesta 1, 2 and 3, Asia Brickell Key, Carbonell Brickell Key, Courts and Courvoisier. There has been speculation that the land right next to the Mandarin Oriental hotel will be developed by Swire Properties and will be turned into a condo building, possibly Mandarin Residences. Home prices range from $239,000 for a one-bedroom, one-bathroom condo in the Isola condominium building to $8,830,000 for a four-bedroom, five-bathroom condo in the Asia community. Simply desire to say your post is as surprising. The clarity in your post is just nice and I could assume you’re an expert on this subject. Thanks a million and please keep up the rewarding work.